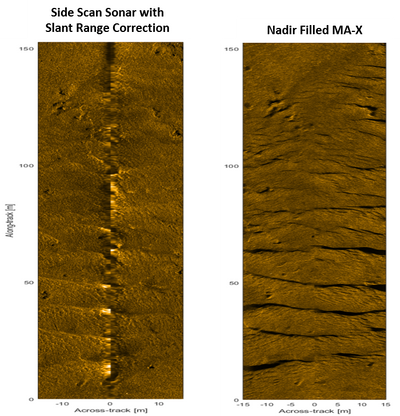 Side scan sonar equipment developer Klein Marine Systems has developed a new, patent-pending technology called MA-X it believes will redefine ocean imaging, Klein's parent company Mitcham Industries announced this week. MA-X is essentially the next generation of side scan sonar whose arrays are physically mounted at an angle relative to the towfish or autonomous underwater vehicles (AUV) platform, Klein Marine Systems said. In this way, each narrow fan-beam is oriented at a downward and forward-grazing angle, resulting in an acoustic track over the sea bottom that starts from the port and starboard side and extends diagonally forward across the nadir ahead of the platform. MA-X allows for seamless imaging of the entire swath, including the nadir area where traditional side scan sonar imaging leaves a gap. This gap in data requires overlapping survey lines which leads to additional survey time to achieve 100% coverage. According to Klein Marine Systems, a cost-effective "gap-filler" solution has long been sought by the industry, as Traditional gap-fillers tend to be expensive or of low image quality. The new MA-X technology will provide unmatched image quality and an estimated 40% increase in the coverage rate and survey efficiency (i.e. fuel, survey time), Klein believes. Guy Malden, Co-CEO of Mitcham Industries, commented, "In our opinion, MA-X represents a paradigm shift in seafloor imaging. 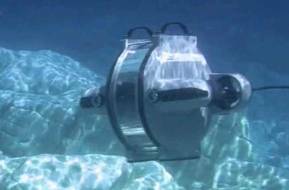 We believe it to be a cost-effective, attractive and low-risk gap-filling sonar solution, capable of being immediately adopted on AUVs of all sizes – even in conjunction with other manufacturers' sonars, including SAS [synthetic aperture sonar]. This MA-X technology should provide Klein with an attractive value proposition and the ability to rapidly expand its penetration of the AUV and towed side scan sonar market." The immediate benefits of MA-X technology are shorter survey time and more predictable surveys in windows of good weather. For AUV operators, this translates into either longer autonomy or smaller size battery, i.e., lower cost or more payload space. In addition, the MA-X imagery has the same interpretative characteristics as side scan images (grazing angle, shadows) and therefore, no operator re-training is needed.